The Dow Jones Industrial Average is entering the new week with what is undoubtedly the cleanest bull retracement pattern of the year. Hungry dip buyers were salivating all weekend long in anticipation of a potentially profitable meal. And if you’ve seen what Dow Jones stocks are doing this morning, then you know these hopes were not in vain. Large-cap stocks are leading the charge delivering a quick 1% gain to the Dow right out of the gate. What’s perhaps most impressive is the rally comes while the Russell 2000 is falling 0.30% marking some severe divergence between large and small caps. The beauty of last week’s mild retracement and today’s pole vault is that many Dow Jones stocks are flashing attractive entry points. I’ve scoured the entire Index and here are three of the best Dow Jones stocks to buy. American Express (NYSE:AXP) enters the new week having fallen five of the past six trading sessions. The retreat came after AXP stock notched a new record high at $111.77. Shorting a stock after a multi-day retracement from all-time highs has got to be one of the dumbest ideas I can think of. It’s the ultimate low probability play. And that means doing the opposite is smart. Buying dips in an uptrend, particularly one that just surged in momentum like AXP, means you have the wind at your back. And with the stock already down a few percent from the highs, you’re getting a nice discount. Furthermore, we’re now much closer to support levels suggesting the risk is minimal if the setup doesn’t work. Sell the Nov $105/$100 put spread for 97 cents. Oil prices are making a comeback, and Exxon Mobil (NYSE:XOM) shares are loving it. After carving out a low near $76 in mid-August, XOM stock rallied uninterrupted to $87. The ascent saw a groundswell in accumulation days signaling institutions were entering the fray. Last week’s four-day pullback marks the first quality buying opportunity arising in the oil giant in two months. And I think it’s an opportunity worth pouncing on. If the slide persists many support levels loom close including old resistance near $84.50 and the rising 20-day moving average. To build out a high probability of profit, consider selling the Nov $82.50/$77.50 put spread for 70 cents. If XOM stock sits above $82.50 at expiration, you’ll capture the max reward of 70 cents. The initial cost is $4.30. Boeing (NYSE:BA) rounds out today’s trio with a picture perfect breakout play. This morning’s 2.5% takeoff is officially carrying BA stock above major long-term resistance, completing an eight-month base. The expression, “the longer the base, the higher in space” comes to mind here. Given the dominance and duration of Boeing’s trading range this year, the importance of today’s breakout can’t be overstated. It marks the beginning of the stock’s next leg higher and an easy entry point for spectators looking for an excuse to climb aboard finally. Buy the Nov $380/$400 bull call spread for $8. As of this writing, Tyler Craig held bullish options positions in XOM. Want insightful education on how to trade? Check out his trading blog, Tales of a Technician. 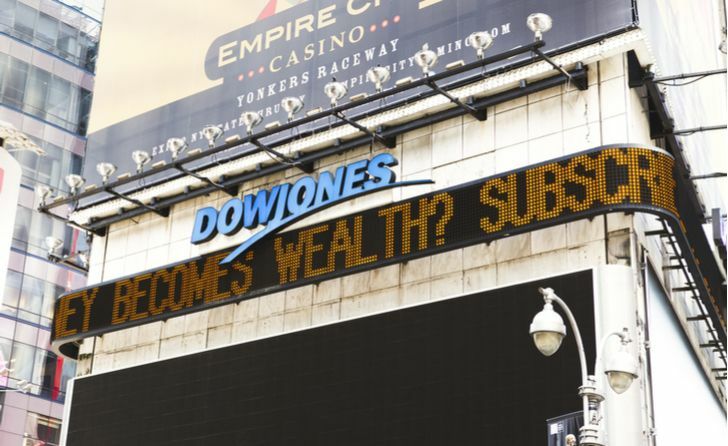 Article printed from InvestorPlace Media, https://investorplace.com/2018/10/3-dow-jones-stocks-to-buy-today/.